Property 4: Perfectly located City Centre apt. Scott House. Property 5: Great views , city centre apartment. Property 8: Bright, spacious newly refurbished in Sunny Dennistoun. Fast wifi Smart UHD TV. Property 11: Stylish & Modern West End, Victorian apt. Property 20: Fantastic, spacious apartment in the heart of Glasgow. Property 25: Superb 1 Bedroom Apartment (sleeps 5) next to SSE Hydro - Airbnb Superhost!! Property 31: Superb penthouse in City Centre. Exceptional views on the River Clyde. Hot Tub! Property 42: Stunning Traditional West End Apt-1 min to Subway! Loved the flat. Perfect for our family of three adults. Very comfortable, clean. Great location. Will stay here again on next trip..
A perfectly located and stylish flat in a stunning building. This flat was superb. 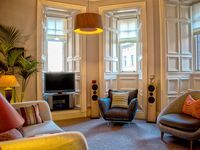 Centrally located and close to the train station, shopping, restaurants and pubs, the building was secure, comfortable and well-maintained with a lovely flair that made the rooms special.